Please note the engine will be delivered with classification lights but we will include a boiler front without the lights for free with the preorder of this engine from Patrick’s Trains. Pat, if you binned the class lights the scale guys would be lining up for them. I pre-ordered one this morning. My first Legacy engine. Pat, what about the firebox color and the cylinder heads? Is this going to be an all black engine? Unless you already have information that Lionel is planning on releasing a separate- sale plain boiler front, it would probably pay to have a run of those made also (if that's possible with parts). Norton, it would be less costly and easier to replace the class-lighted boiler front than the other way around. Although I prefer the lights, I would be interested in a plain front if reasonably priced. Dave, having changed the 5444 front to plain it would only be easier if the plain front was available. No word that that will be the case. Otherwise it would be easier to drill holes and add lights to plain front than filling holes and trying to match the paint. With Pat's offering there will now be six J3s offered, all with Class lights. All of the standard tender engines will be wrong as Class lights if used happened well after the Hudsons were removed from the name trains. You would have never seen class lights on the parent companies tracks anywhere, anytime and only on some of the subs west of Cleveland. 5405 as built would not have had them, nor any J3a heading a train in 1939. The Roman lettering on the other two standard tender engines would date them pre 1945 so no class lights. Its not a big deal for me as I already have the two TMCC engines plus a number of other J3s but I know of at least 4 others who won't be ordering any because of the class lights as well as a few here who have said the same thing. I will ask Lionel if they can make a few of these J3a Hudson’s with no marker lights. I would ask you guys to let me know who would want one. Please give me a call at the store or reply to this thread. I will add that, this engine had marker lights at one point in its career. It makes no difference to me whether the engine does or doesn't have class lights. So, if Lionel will make the engines only with or without (I would be very surprised if Lionel will make them without) lights, I am fine without. If enough guys come forward, I will try to get them to make some with no lights. Actually Pat, if Lionel would just remake the front with no lights that was used on 5433 I think most all that want them could change the fronts out ourselves. Neither you nor Lionel would have the make that engine both ways. Just make the part available to anyone that wants it. The headlight would not be required. I would be in for one without. I will sign up for one on Monday if I can switch my existing pre-order for #5405 to another item (probably #611 S of R). The #5416 is more to my liking (without white wheels and stripes). I don't like the cars with the Pacemaker set (thumb tacks), so didn't go that route. I went with the Defense Specials...they should look good with a J3a. Pat I would for sure commit to one without lights. I’m interested eithier way but for sure without. Do we need to give you a call to make it official? I also am curious of the smoke box finish and cylinder head color on these. I saw someone had asked but I didn’t see it addressed. Pete summed it up in a nutshell. There are now six engines being made/proposed. Having this additional front doubles the available engine styles to twelve. Making another engine just for this change does not garner sales from those wanting one of the previous five without lights. All that is needed is a note in the box with the engine stating that the part is available on Lionel's website or through their dealer. And make enough to have the part available for a year. I applaud Pats effort in getting an uncataloged model made. Given Lionels track record of "what you see isn't necessarily what you'll get". Outside of driver type and lack of pinstriping its gonna be a crapshoot as far as smokebox or steamchest. I'm inclined to think this model will be the set model with a different cab number. I also think the jury is out until delivery regarding the smokebox on any of the models. Ryan stated on the facebook show that each model represents a different time period, but did not mention any specifics regarding color etc. I'm not sure why Lionel is dodging the "no class lights". Maybe the boiler front tooling is missing. As someone who's not interested in ordering, but just reading through the thread...It would make some sense to me that Lionel should just add the extra boiler front for the engine in the box, and if someone wanted no lights, they can just change out the front. I cant see the cost being that much of a difference. Cudo's to Pat for making this happen for you guys. The following is from the first post in this thread. "This engine is a sister engine to The Pacemaker 5410 and would look great doubled headed." I took this to mean it would be exactly the same as the set engine except with cab number 5416. And after talking to Pat when I placed my order, I am certain it is the same engine. Exactly. Which will mean class lights. Smoke box color will remain to be seen regardless. I also question the polished cylinder heads. In fact ,the second run of legacy FEF's did not actually have the polished cylinder heads like the first. They were merely painted silver. I'm getting lost at this point. As I stated above, doesn't matter if engine has the lights or not. When I placed my order, it was because the uncatalogued engine would be like the set engine, no white stripes, no whitewall drivers, nor would it have mixed drivers but like all the J3A engines, it would have class lights. Pat later posted that he would see if Lionel would make some of the engines without class lights. I posted that I want the engine regardless of whether class lights are included or not and that IF Lionel would only make the 25 uncatalogued engines either with or without class lights I was fine without so that the engine would appeal to a wider audience. If (and I highly doubt that this will happen but I have been wrong before) Lionel makes some with and some without, I will take one with class lights. Those blasted lights. Not present in the photo, it seems - the photo of the model's purported actual prototype. It has gotten to be a big thing precisely because it is such a small Lionel-correctable thing. So this offering will look nothing like the photo above? It appears Lionel doesn't have the tooling to do the smokebox without the marker lights, nor to invest into re-tooling the piece. I find it hard to believe in this day and age Lionel couldn't have a boiler front produced. Either way they will sell a Bazillion of these beauties anyway. "On track, on time, and over budget!" Since another dealer has announced that Lionel will make this engine with a PT tender and without class lights exclusively for that dealer perhaps Pat will be able to get his engine made without class lights also. See, reverse psychology works every time. All I have to say is something likely won't happen and it does. I wanted to let you guys know of our solution to the classification lights. I had a great conversation with John Bickford from Lionel today and we talked about the solution of the classification lights on the boiler front. Here is our solution, I will for no extra cost to the customer order extra boiler fronts without the lights and include them for free with the preorder of our Hudson. 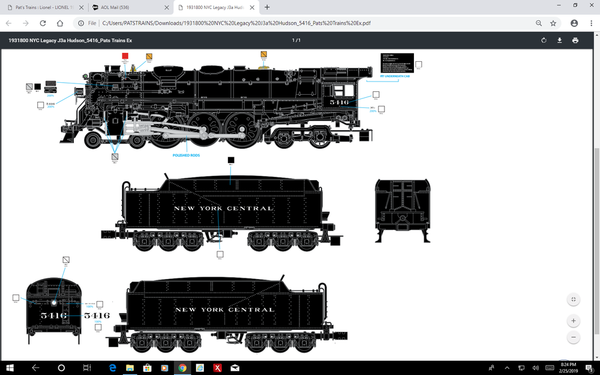 Pat, I just placed my Pre-order on line for the Stock Number 19314ZZ Uncatalogued Exclusive New York Central Legacy J3A #5416 Hudson. I am glad that both boiler fronts will come with the engine. I look forward to its arrival. Thank you. I will for no extra cost to the customer order extra boiler fronts without the lights and include them for free with the preorder of our Hudson. I am looking forward to getting this #5416 Hudson. This engine solved my dilemma as to which Hudson I should pre-order. I like the BoxPox Wheels and did not want a mix of drivers on the engine. My NYC Empire State engines have the Disc Wheels, so the #5416 gives me exactly what I want. It will come with classification lights and another second boiler front without the lights. Win-win. Way to go on the class lights issue! Wonder if Lionel will make these available for the cataloged engines...? Marker lights, no marker lights...I want WHITEWALLS! Guess I'll just stick with my Flyer Hudson. I want to say thanks to all of you guys for ordering our Special Run Hudson. We only have 3 pieces left and they are sold out. Thank you for the update. Good to know this version is a success too. Trying to figure out if this special run has the regular or PT tender? I would guess by the pic Pat posted, it's the regular tender. Pat's uncatalogued engine has the same tender as the Pacemaker set engine. I understand that to be the regular tender. Pat is including a boiler front without class lights with each of his engines. As of today there are only 2 Hudson Engines left. 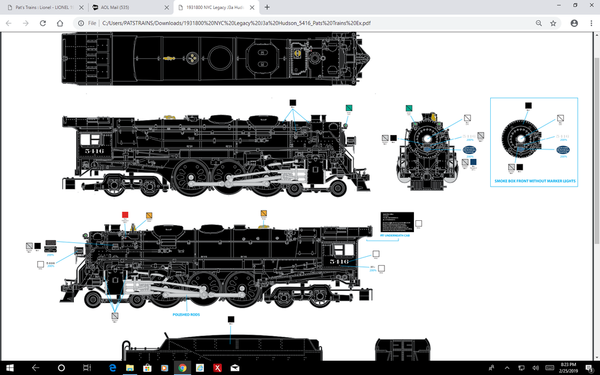 Please view the Lionel Update drawings of our Special J3A. Please note as of today 2/25/2019 these Hudsons are sold out. Thanks for posting the drawings. Looks good. Any reason you are holding it to 25? Just curious. If there is demand why not meet it?